For other uses, see Lomonosov (disambiguation). Mikhail Vasilyevich Lomonosov (/ˌlɒməˈnɒsɒf/; Russian: Михаи́л (Михáйло) Васи́льевич Ломоно́сов, IPA: [mʲɪxɐˈil vɐˈsʲilʲjɪvʲɪtɕ ləmɐˈnosəf] ( listen); November 19 [O.S. November 8] 1711 – April 15 [O.S. April 4] 1765) was a Russian polymath, scientist and writer, who made important contributions to literature, education, and science. Among his discoveries were the atmosphere of Venus and the law of conservation of mass in chemical reactions. His spheres of science were natural science, chemistry, physics, mineralogy, history, art, philology, optical devices and others. Lomonosov was also a poet and influenced the formation of the modern Russian literary language. Lomonosov was born in the village of Mishaninskaya (later renamed Lomonosovo in his honor) in Archangelgorod Governorate, on an island not far from Kholmogory, in the far north of Russia. His father, Vasily Dorofeyevich Lomonosov, was a prosperous peasant fisherman turned ship owner, who amassed a small fortune transporting goods from Arkhangelsk to Pustozyorsk, Solovki, Kola, and Lapland. Lomonosov's mother was Vasily's first wife, a deacon's daughter, Elena Ivanovna Sivkova. He remained at Denisovka until he was ten, when his father decided that he was old enough to participate in his business ventures, and Lomonosov began accompanying Vasily on trading missions. Learning was young Lomonosov's passion, however, not business. The boy's thirst for knowledge was insatiable. Lomonosov had been taught to read as a boy by his neighbor Ivan Shubny, and he spent every spare moment with his books. He continued his studies with the village deacon, S.N. Sabelnikov, but for many years the only books he had access to were religious texts. When he was fourteen, Lomonosov was given copies of Meletius Smotrytsky's Modern Church Slavonic (a grammar book) and Leonty Magnitsky's Arithmetic. Lomonosov was a Russian orthodox all his life, but had close encounters with Old Believers schism in early youth and later in life he became a deist. In 1724, his father married for the third and final time. Lomonosov and his stepmother Irina had an acrimonious relationship. Unhappy at home and intent on obtaining a higher education, which Lomonosov could not receive in Mishaninskaya, he was determined to leave the village. 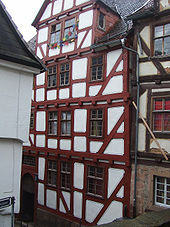 The Lomonosov house in Marburg, Germany. In 1730, at nineteen, Lomonosov went to Moscow on foot, because he was determined to "study sciences". Shortly after arrival, he admitted into the Slavic Greek Latin Academy by falsely claiming to be a son of a Kholmogory nobleman. In 1734 that initial falsehood as well as another lie for him to be son of a priest nearly got him expelled from the academy but the investigation ended without severe consequences. Lomonosov lived on three kopecks a day, eating only black bread and kvass, but he made rapid progress scholastically. It is believed that in 1735, after three years in Moscow he was sent to Kiev to study for short period at the Kyiv-Mohyla Academy. He quickly became dissatisfied with the education he was receiving there, and returned to Moscow to resume his studies there. In five years Lomonosov completed a twelve-year study course and in 1736, among 12 best graduates, was awarded a scholarship at the St. Petersburg Academy. He plunged into his studies and was rewarded with a four-year grant to study abroad, in Germany, first at the University of Marburg and then in Freiberg. The University of Marburg was among Europe's most important universities in the mid-18th century due to the presence of the philosopher Christian Wolff, a prominent figure of the German Enlightenment. Lomonosov became one of Wolff's students while at Marburg from November 1736 to July 1739. Both philosophically and as a science administrator, this connection would be the most influential of Lomonosov's life. In 1739–1740 he studied mineralogy, metallurgy, and mining at Bergrat Johann Friedrich Henckel's [de] laboratory in Freiberg, Saxony; there he intensified his studies of German literature. The most grandiose of Lomonosov's mosaics depicts the Battle of Poltava. Lomonosov quickly mastered the German language, and in addition to philosophy, seriously studied chemistry, discovered the works of 17th century Irish theologian and natural philosopher, Robert Boyle, and even began writing poetry. He also developed an interest in German literature. He is said to have especially admired Günther. His Ode on the Taking of Khotin from the Turks, composed in 1739, attracted a great deal of attention in Saint Petersburg. Contrary to his adoration for Wolff, Lomonosov went into fierce disputes with Henckel over the training and education courses he and his two compatriot students were getting in Freiberg as well as over very limited financial support which Henckel was instructed to provide to the Russians after numerous debts they made in Marburg. As the result, Lomonosov left Freiberg without permission and wandered for quite a while over Germany and Holland unsuccessfully trying to get a permission from Russian envoys to return to the St.Petersburg Academy. During his residence in Marburg, Lomonosov boarded with Catharina Zilch, a brewer's widow. He fell in love with Catharina’s daughter Elizabeth Christine Zilch. They were married in June 1740. Lomonosov found it extremely difficult to maintain his growing family on the scanty and irregular allowance granted him by the Russian Academy of Sciences. As his circumstances became desperate, he resolved and got permission to return to Saint Petersburg. Lomonosov returned to Russia in June 1741, after being abroad 4 years and 8 months. A year later he was named an Adjunct of the Russian Academy of Science in the physics department. In May 1743, Lomonosov was accused, arrested, and held under house arrest for eight months, after he supposedly insulted various people associated with the Academy. He was released and pardoned in January 1744 after apologising to all involved. Lomonosov was made a full member of the Academy, and named Professor of chemistry, in 1745. He established the Academy's first chemistry laboratory. Eager to improve Russia’s educational system, in 1755, Lomonosov joined his patron Count Ivan Shuvalov in founding Moscow University. In 1760, he was elected a Foreign Member of the Royal Swedish Academy of Sciences. In 1764, he was elected Foreign Member of the Academy of Sciences of the Institute of Bologna  In 1764, Lomonosov was appointed to the position of the State Councillor which was of Rank V in the Russian Empire's Table of Ranks. He died on 4 April (o.s. ), 1765 in Saint Petersburg. He is widely and deservingly regarded as the "Father of Russian Science", though many of his scientific accomplishments were relatively unknown outside Russia until long after his death and gained proper appreciation only in late 19th and, especially, in 20th centuries. Catherine II of Russia visits Mikhail Lomonosov in 1764. 1884 painting by Ivan Feodorov. In 1756, Lomonosov tried to replicate Robert Boyle's experiment of 1673. He concluded that the commonly accepted phlogiston theory was false. Anticipating the discoveries of Antoine Lavoisier, he wrote in his diary: "Today I made an experiment in hermetic glass vessels in order to determine whether the mass of metals increases from the action of pure heat. The experiments – of which I append the record in 13 pages – demonstrated that the famous Robert Boyle was deluded, for without access of air from outside the mass of the burnt metal remains the same". That is the Law of Mass Conservation in chemical reaction, which was well-known today as "in a chemical reaction, the mass of reactants is equal to the mass of the products." Lomonosov, together with Lavoisier, is regarded as the one who discovered the law of mass conservation. He stated that all matter is composed of corpuscles – molecules that are "collections" of elements – atoms. In his dissertation "Elements of Mathematical Chemistry" (1741, unfinished), the scientist gives the following definition: "An element is a part of a body that does not consist of any other smaller and different bodies ... corpuscle is a collection of elements forming one small mass." In a later study (1748), he uses term "atom" instead of "element", and "particula" (particle) or "molecule" instead of "corpuscle". He regarded heat as a form of motion, suggested the wave theory of light, contributed to the formulation of the kinetic theory of gases, and stated the idea of conservation of matter in the following words: "All changes in nature are such that inasmuch is taken from one object insomuch is added to another. So, if the amount of matter decreases in one place, it increases elsewhere. This universal law of nature embraces laws of motion as well, for an object moving others by its own force in fact imparts to another object the force it loses" (first articulated in a letter to Leonhard Euler dated 5 July 1748, rephrased and published in Lomonosov's dissertation "Reflexion on the solidity and fluidity of bodies", 1760). 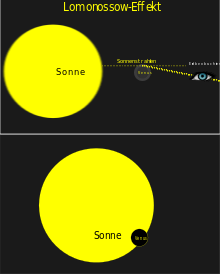 Scheme of the Lomonosov-Effect during a transit of Venus. 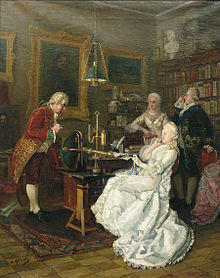 Lomonosov was the first to discover and appreciate the atmosphere of Venus during his observation of the transit of Venus of 1761 in a small observatory near his house in St Petersburg. In June 2012 a group of astronomers carried out experimental reconstruction of Lomonosov's discovery of Venusian atmosphere with antique refractors during the transit of Venus (5–6 June 2012). 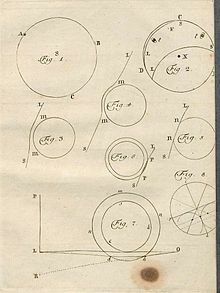 They concluded that Lomonosov's telescope was fully adequate to the task of detecting the arc of light around Venus off the Sun's disc during ingress or egress if proper experimental techniques as described by Lomonosov in his 1761 paper are employed. In 1762, Lomonosov presented an improved design of a reflecting telescope to the Russian Academy of Sciences forum. His telescope had its primary mirror adjusted at an angle of four degrees to the telescope's axis. This made the image focus at the side of the telescope tube, where the observer could view the image with an eyepiece without blocking the image. However, this invention was not published until 1827, so this type of telescope has become associated with a similar design by William Herschel, the Herschelian telescope. In 1759, with his collaborator, academician Joseph Adam Braun, Lomonosov was the first person to record the freezing of mercury and to carry out initial experiments with it. Believing that nature is subject to regular and continuous evolution, he demonstrated the organic origin of soil, peat, coal, petroleum and amber. In 1745, he published a catalogue of over 3,000 minerals, and in 1760, he explained the formation of icebergs. In 1763, he published On The Strata of the Earth – his most significant geological work. Lomonosov's observation of iceberg formation led into his pioneering work in geography. Lomonosov got close to the theory of continental drift, theoretically predicted the existence of Antarctica (he argued that icebergs of the South Ocean could be formed only on a dry land covered with ice), and invented sea tools which made writing and calculating directions and distances easier. In 1764, he organized an expedition (led by Admiral Vasili Chichagov) to find the Northeast Passage between the Atlantic and Pacific oceans by sailing along the northern coast of Siberia. Lomonosov was proud to restore the ancient art of mosaics. In 1754, in his letter to Leonhard Euler, he wrote that his three years of experiments on the effects of chemistry of minerals on their colour led to his deep involvement in the mosaic art. In 1763, he set up a glass factory that produced the first stained glass mosaics outside of Italy. There were forty mosaics attributed to Lomonosov, with only twenty-four surviving to the present day. 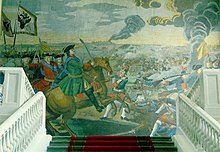 Among the best is the portrait of Peter the Great and the Battle of Poltava, measuring 4.8 by 6.4 metres (16 ft × 21 ft). In 1755 Lomonosov wrote a grammar that reformed the Russian literary language by combining Old Church Slavonic with the vernacular tongue. To further his literary theories, he wrote more than 20 solemn ceremonial odes, notably the Evening Meditation on the God's Grandeur. He applied an idiosyncratic theory to his later poems – tender subjects needed words containing the front vowel sounds E, I, Y and U, whereas things that may cause fear (like "anger", "envy", "pain" and "sorrow") needed words with back vowel sounds O, U and Y. That was a version of what is now called sound symbolism. In 1760 Lomonosov published a History of Russia. In addition, he attempted to write a grand epic about Peter the Great, to be based on the Aeneid by Vergil, but he died before he could finish it. His granddaughter Sophia Konstantinova (1769–1844) married Russian military hero and statesman General Nikolay Raevsky. 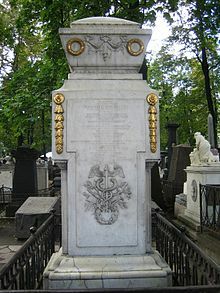 His great-granddaughter was Princess Maria (Raevskaya) Volkonskaya, the wife of the Decembrist Prince Sergei Volkonsky. The city of Lomonosov, Russia (former Oranienbaum, Russia from 1710–1948), and a lunar crater bear his name, as does a crater on Mars and the asteroid 1379 Lomonosowa. The Imperial Porcelain Factory, Saint Petersburg was renamed after him from 1925 to 2005. In 1948, the underwater Lomonosov Ridge in the Arctic Ocean was named in his honor. Moscow State University was renamed '’M. V. Lomonosov Moscow State University'’ in his honor in 1940. The Lomonosov Gold Medal was established in 1959 and is awarded annually by the Russian Academy of Sciences to a Russian and a foreign scientist. Lomonosovskaya Station on the Nevsko-Vasileostrovskaya Line of the Saint Petersburg Metro is named after him. It was opened in 1970. The street "Lomonosova iela" in the Maskavas Forštate district of Riga is named in honor of Lomonosov. During the Soviet era a main street in Tallinn, Estonia, was named in his honor as "Lomonossovi M.", but from 1991 it was renamed Gonsiori after Jakob Johann Gonsior, a 19th-century alderman and lawyer. The Akademik Lomonosov, the first of a series of Russian floating nuclear power stations, is named for him. It is expected to be operational at Pevek, Chukotka in September 2019. Lomonosov, Mikhail (1767). A Chronological Abridgement of the Russian History. Translated by J.G.A.F. for T. Snelling. [London, Printed for T. Snelling]. Lomonosov, Mikhail (1966). Panegyric to the Sovereign Emperor, Peter the Great. Translated by Ronald Hingley in Marc Raeff, ed. Russian Intellectual History: An Anthology. Prometheus Books. ISBN 978-0391009059. Lomonosov, Mikhail (1970). Mikhail Vasil'evich Lomonosov on the Corpuscular Theory. Translated by Henry M. Leicester. Harvard University Press. ISBN 978-0674574205. Lomonosov, Mikhail (2012). The Appearance of Venus on the Sun, Observed at the St.Petersburg Imperial Academy of Sciences on May 26, 1761. Translated by Vladimir Shiltsev in "Lomonosov's Discovery of Venus Atmosphere in 1761: English Translation of Original Publication with Commentaries". arXiv:1206.3489. Lomonosov, Mikhail (2012). On the Strata of the Earth. Translation and commentary by S.M. Rowland and S. Korolev. The Geological Society of America, Special Paper 485. ISBN 978-0-8137-2485-0. Lomonosov, Mikhail (2017). Oratio De Meteoris Vi Electrica Ortis – Discourse on Atmospheric Phenomena Originating from Electrical Force (1753). Translation and commentary by Vladimir Shiltsev. arXiv:1709.08847. Lomonosov, Mikhail (2018). Meditations on Solidity and Fluidity of Bodies (1760). Translation and commentary by Vladimir Shiltsev. arXiv:1801.00909. Lomonossow, Michail (1961). Michail Wassiljewitsch Lomonossow. Ausgewählte Schriften in zwei Bänden. Berlin-Akademie Verlag. Lomonosov, Michail (2015). Erste Grundlagen Der Metallurgie Oder Des Huttenwesens (1763). Herausgegeben und kommentiert von Friedrich Naumann. Walter de Gruyter. ISBN 978-3110424072. Lomonosov, Michail (2017). Schriften zur Geologie und zum Berg- und Hüttenwesen (1742–1765). Herausgegeben und kommentiert von Friedrich Naumann. Walter de Gruyter. doi:10.1515/9783110424065. ISBN 978-3-11-042406-5. ^ "Lomonosov". Random House Webster's Unabridged Dictionary. ^ a b Menshutkin 1952, p. 11. ^ a b c Menshutkin 1952, p. 12. ^ Menshutkin 1952, p. 13. ^ Galina Evgenʹevna Pavlova; Aleksandr Sergeevich Fedorov (1980). Mikhail Vasilievich Lomonosov: his life and work. Mir. p. 161. The atheistic direction of Lomonosov's scientific and artistic creativity was not always consistent. His world outlook, just as that of many other representatives of the age of enlightenment, possessed elements of deism according to which God, having created the universe, assumed no control over its development which was governed by the laws of nature. Lomonosov's deism was no chance factor. As Karl Marx aptly put it, deism was the most convenient and easiest way for many materialists of the 17th-18th centuries to abandon religion. ^ Andrew Kahn (2008). Pushkin's Lyric Intelligence. Oxford University Press. p. 130. ISBN 9780191552939. No atheistic conclusions spring from 'The Orb of Day has Set' to reverse Lomonosov's deism, but the poem still intrudes a painful gap between man and nature. ^ a b Menshutkin 1952, p. 15. ^ Menshutkin 1952, p. 16. ^ Menshutkin 1952, p. 20. ^ a b Menshutkin 1952, p. 17. ^ Menshutkin 1952, p. 23. ^ Menshutkin 1952, p. 24. ^ a b c d e f g h i Menshutkin 1952. ^ Pavlova, Galina E., and Fedorov, Aleksandr S. Mikhail Vasilievich Lomonosov: His Life and Work (English Translation). Mir: Moscow, 1980. ^ Menshutkin 1952, p. 120. ^ Pomper, Philip (October 1962). "Lomonosov and the Discovery of the Law of the Conservation of Matter in Chemical Transformations". Ambix. 10 (3): 119–127. doi:10.1179/amb.1962.10.3.119. ^ Lomonosov, Mikhail Vasil'evich (1959). Mikhail Vasil'evich Lomonosov on the Corpuscular Theory. Translated by Leicester, Henry M. Cambridge, Massachusetts: Harvard University Press. pp. 56–57. ^ Shiltsev, Vladimir (March 2014). "The 1761 Discovery of Venus' Atmosphere: Lomonosov and Others". Journal of Astronomical History and Heritage. 17 (1): 85–112. Bibcode:2014JAHH...17...85S. ^ Elena Lavrenova. "Lomonosov biography". Foxdesign.ru. Retrieved 2 May 2011. ^ "М.В. Ломоносов: к 300-летию со дня рождения". narfu.ru. Retrieved 2 May 2011. ^ "М.А. Безбородое М.В. Ломоносов. Фабрика В Усть-Рудицах". Grokhovs1.chat.ru. 5 December 2001. Retrieved 2 May 2011. ^ Sutherland, Christine (1984). The Princess of Siberia: The Story of Maria Volkonsky and the Decembrist Exiles. New York: Farrar, Straus and Giroux. ISBN 978-0-374-23727-1. ^ Hamilton, Simon. "A Rambling Dictionary of Tallinn Street Names". Archived from the original on 26 June 2011. ^ Russian floating nuclear power station undergoes mooring tests, NuclearPowerDaily.com, 7 July 2016, accessed 25 July 2016. ^ "Work starts on on-shore infrastructure for Russian floating plant". World Nuclear News. Retrieved 4 January 2019. Crease, Robert (November 2011). "Mikhail Who?". Physics World. Shiltsev, Vladimir (November 2011). "Nov. 19, 1711: Birth of Mikhail Lomonosov, Russia's first modern scientist". APS News. 20 (10). Crease, Robert (August 2012). "Transit Watching". Physics World. Crease, Robert; Shiltsev, Vladimir (December 2013). "Pomor Polymath: The Upbringing of Mikhail Vasilyevich Lomonosov, 1711–1730". Physics in Perspective. 15 (4): 391–414. Bibcode:2013PhP....15..391C. doi:10.1007/s00016-013-0113-5. C.A. Johnson (June 1964). "Lomonosov's Dedication to His Russian grammar". Slavic Review. 23 (2): 328–332. doi:10.2307/2492939. JSTOR 2492939. This page is based on the Wikipedia article Mikhail Lomonosov; it is used under the Creative Commons Attribution-ShareAlike 3.0 Unported License (CC-BY-SA). You may redistribute it, verbatim or modified, providing that you comply with the terms of the CC-BY-SA.